Audrey’s world is full of technology which is at the extremes of where we’re heading now. I can see where a lot of it has coming from logically, but there is so much change from now, it doesn’t feel like Earth. I did like how southern Europe has become arid and Spain was a blistering desert, with remote warehouses supporting the new industry but not much else. Also, the Resurrection Zone was somewhat relatable to London Zoo (it helps it’s in Regent’s Park). I felt the scenes in the zoo were some of the most thought-provoking and powerful. For the most part, the narrative is Audrey’s but there are a few chapters from Daniel’s point of view, which felt a bit more contemplative. Audrey’s suffering from grief at the start of the book and uses patches to numb the pain. There is a fair amount of time devoted to this, which reflects Matt Haig’s experiences with depression. Even Daniel, could be described to have had depression at one point if you project his thoughts onto a human mind. This might well be better received by those that haven’t read much robot science fiction. Somewhere in my head I was expecting another The Mad Scientist’s Daughter and emotionally this fell a bit short. Younger readers who can become enamoured with the future tech and action will undoubtedly enjoy it. But in a book about robots, I need some ethical dilemmas or moral ambiguity. The people who mistreated robots were horrible people and I think they enjoyed it no matter if they were sentient or not. We already anthropomorphise our technology and it doesn’t look like us (I feel I have to be polite to my boyfriend’s car otherwise the door won’t open). A robot that is nearly identical to us, would be a hard thing to act cruel towards, even if was an unfeeling machine. I think it needed more conflicted characters. Actually I’m not sure what the Echoes really are. They are introduced as androids but seem to be mostly biological. I wanted a bit more on their history rather than the other tech in their world. There seemed a lot to fit in and the pace was a bit on the slow side because of this. I think delayed instalove is becoming a thing. Just because it doesn’t happen at the start of the story, doesn’t mean it doesn’t feel like instalove when there’s no real emotional build up. There needs to be a believable like going on before love. It’s especially hard to believe when it’s an otherwise awkward coupling. 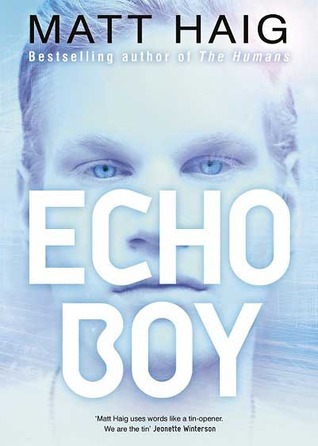 Sign into Goodreads to see if any of your friends have read Echo Boy. I was really looking forward to this but only gave it three stars too - hopefully I'll get round to reviewing it soon and we can compare notes!